* This installer contains the restoration, but combined with the fix for the raindrops sharper of the two versions DX9 and DX11, so if you want to restore the original files from the patch 1.01, use the other installer. Please do not criticize me, my first job with textures, I never used Photoshop in life. the difference is in color shades and shapes of brightness for the most varied tastes between lighter and darker. the highlight is the spray in spiral, and smoke of sand and gravel in dry weather, which is also in spiral. 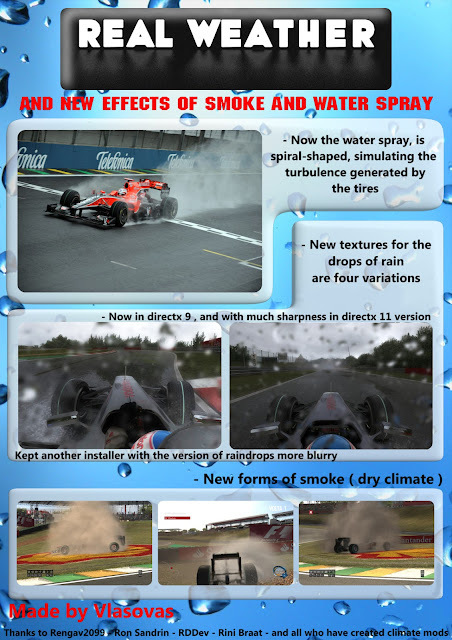 this mod looks great, with the climate mod "codemasters effects 4.4"
personally, I just did a test with the "RDDev gladlight weather mod v12"
Otherwise there could be problems. Make this change before you start playing. change blur="true" quality="2" to blur="true" quality="1"
o 1.1 tem um fix para as gotas de agua funcionar como eram antes do patch, menores e menos pixeladas em DX 9, mas preste atenção, para usar o 1.1 vc deve mudar o postprocess para médio nas configurações de graficos do jogo, ou vc não vai entrar no jogo, funciona tambem para quem tem DX 11 e tambem melhora as gotas de agua. 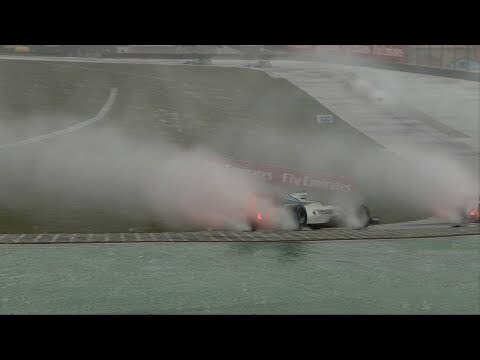 e tem uma versão com as gotas de agua em HD, não há muita diferença, mas tambem deixe o post process em médio para funcionar. 1.0 - Contém o instalador do mod inicial, onde é feito inteiramente com base no patch 1.01.
os pingos de chuva estão mais borradas. e não é legal em DirectX 9, DirectX 11 apenas.